Today, I’m blogging from the Harvard University Archives. I’m five boxes deep into the Simon Kuznets collection, for my second visit related to my dissertation research. 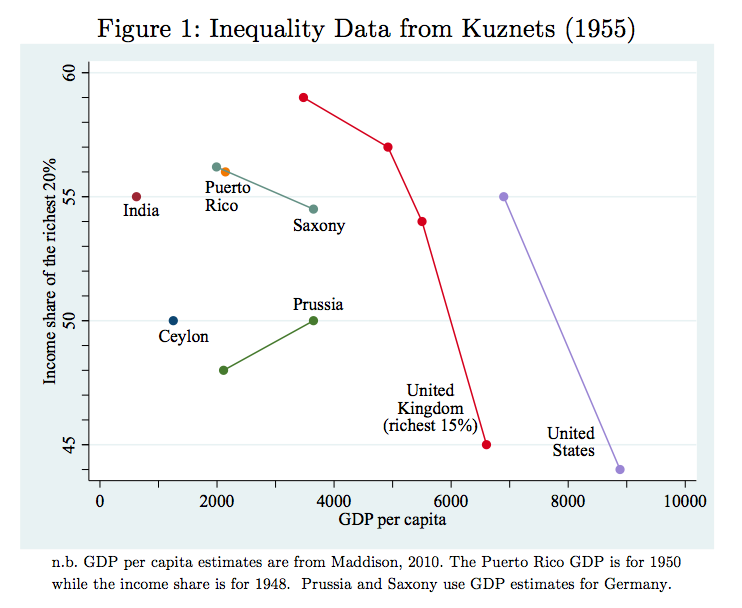 I just came across a letter that, while not especially important to my dissertation, seemed like it might be of wider use to anyone interested in the history of the “Kuznets Curve.” Simon Kuznets, in addition to spearheading the first official US national income statistics in 1932-1934, is probably most famous for this curve/hypothesis. * In his presidential address to the American Economics Association in December of 1954, later published as Economic Growth and Income Inequality, Kuznets argued that income inequality and economic growth might have an inverted-U shaped relationship. 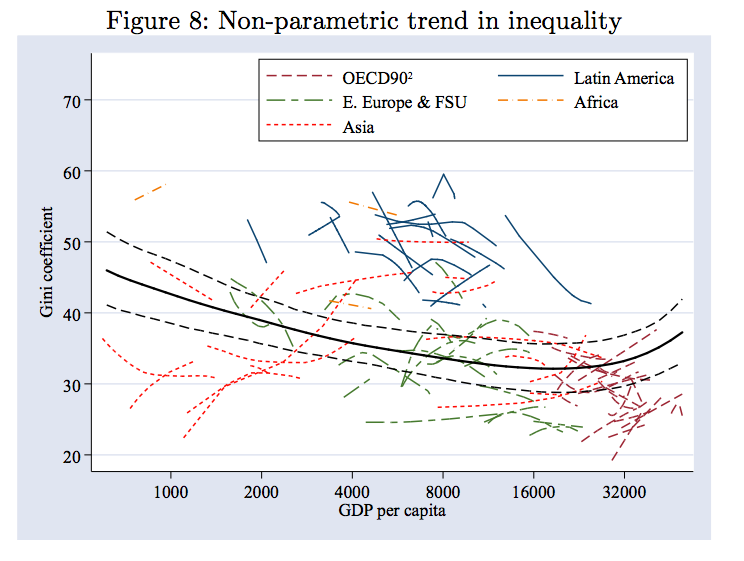 That is, as economic growth/development increases, inequality first goes up and then comes back down. 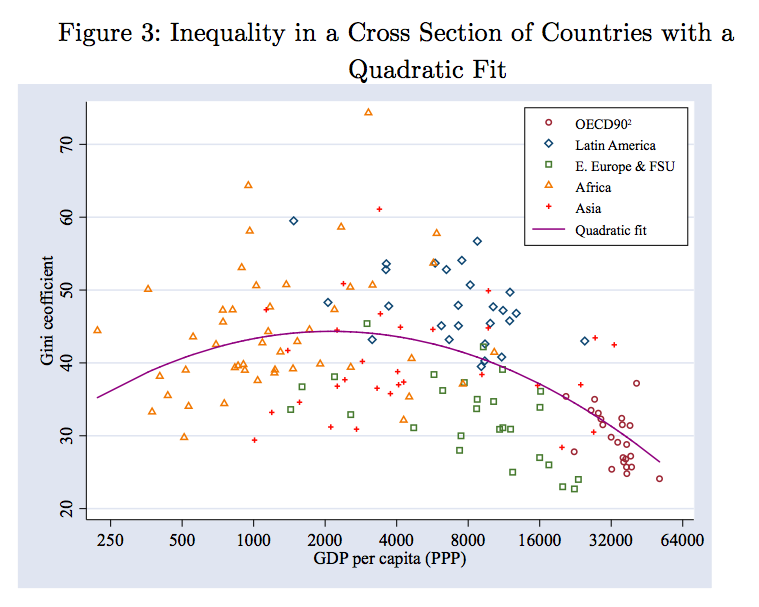 Kuznets showed that inequality fell in two high-income countries as they grew richer after World War I, but he had no evidence of rising inequality at low income levels. Ironically, Kuznets’ prediction that inequality will rise during the early stages of development, for which he had no evidence, is better remembered than his prediction that inequality will fall at higher incomes. Let’s just stress that again: Kuznets had absolutely no evidence that inequality within the agricultural sector was less than the industrial one. Kuznets guesses that this discrepancy between his theoretical intuition and the data has something to do with the data not quite matching what they want – there’s higher year-to-year variability in farm incomes, but in the long-run the inequality within families might be less than appears in the data, or something like that. He’s not sure. And that uncertainty, among many others, is reflected in his strong caveats at the end of presidential address. Years later, Kuznets himself would abandon the curve and caution against looking for historical laws of development, especially in cross-sectional data (Moran 2005). And yet the debate over it lives on, as does the search for laws of economic growth and development. **Papers of Simon Kuznets, Harvard University Archives, HUGFP88.10 Misc. Correspondence, Box 4.